Rio de Janeiro, Brazil – Dressage competition got underway Wednesday at the 2016 Rio Olympic Games, as 29 of the total 60 competitors representing 19 countries took to the main arena under cloudy skies at the Deodoro Olympic Equestrian Center to perform in the Grand Prix, the first test in the team competition. The U.S. team, going eighth in the order of the 11 nations, finished day one in fourth place after two superb performances from Allison Brock and Kasey Perry-Glass. Leading the team standings is Germany, while The Netherlands sits in second place, and Great Britain holds third. Brock (Loxahatchee, Fla.), competing in her first Olympic Games, had the position of riding as pathfinder for the U.S. but kept her cool aboard Rosevelt, a 14-year-old Hanoverian stallion owned by Claudine and Fritz Kundrun. The pair has had much success at the international level over the past three years, both in the U.S. and Europe, and it clearly showed. With the exception of a mistake in the canter two-tempi changes, they executed a fluid test with several high points. They received many scores of 8 for their transitions and extended work in the walk and trot from the seven judges including Peter Holler (K), Susanne Baarup (E), Gary Rockwell (H), Stephen Clarke (C), Maribel Alonso (M), Thomas Lang (B), and Eddy de Wolff van Westerrode (F). The pair earned a score of 72.686%, placing it tied for seventh in the individual standings. Second to go for the U.S. were Perry-Glass (Orangevale, Calif.) and Dublet, a 13-year-old Dutch Warmblood gelding owned by Diane Perry. Going late in the day, the Olympic first-timers made the most of their moment in the spotlight, earning a score of 75.229% to hold fifth place individually. Despite some noise distractions, the pair performed a smooth and elegant test, which earned many high marks, including multiple 8s from the judges for their passage work and flying changes. The pair also scored several 9s for movements including the right canter pirouette, piaffe-passage transition, and the final halt and salute. Competing for the U.S. in the second half of the Grand Prix on Thursday is Steffen Peters with Legolas 92, riding at 10:54 a.m. ET. Laura Graves and Verdades will anchor the U.S. team, entering the arena at 2:06 p.m. ET. Leading the Individual standings after day one is Germany’s Dorothee Schneider with Showtime FRH on 80.986%, while countryman Sonke Rothenberger and Cosmo hold second with a score of 77.329%. 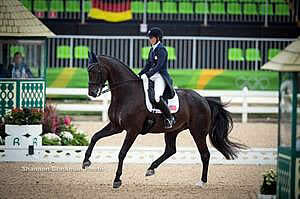 Great Britain’s Fiona Bigwood and Orthilia are in third place on 77.157%. The dressage team competition continues tomorrow, Thursday, August 11. The top six teams from the Grand Prix will move forward to Friday’s Grand Prix Special, after which each team’s top three scores from both tests are added together in order to decide the Team medals. The top 18 competitors from the Grand Prix Special will go on to compete in the individual final, the Grand Prix Freestyle, on Monday, August 15. Only three athletes from each nation are eligible compete in the Freestyle.